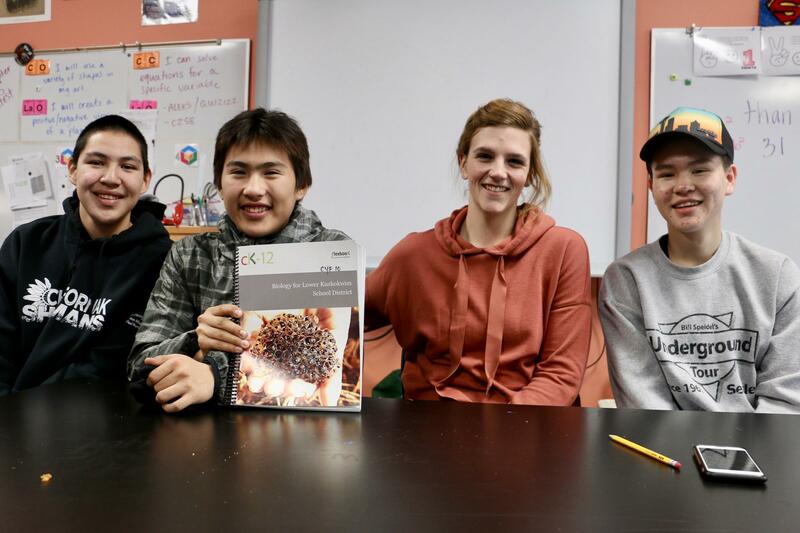 Chefornak High School students pictured with their new CK-12 Foundation biology textbook. From left to right: Matthew Erik, Clayton Panruk, biology teacher Theresa Schallhorn, and Dawson Erik. Picture taken December 16, 2017. Studying high school science in the Yukon-Kuskokwim Delta comes with a whole new textbook. A textbook that’s free, open source, available in print and digital formats, and customized geographically to rural southwestern Alaska. Educators and students alike are excited about the new texts. “From the very cover picture, the kids were interested already,” said Schallhorn. “They flipped it over, they saw an albino moose, and they’re like, ‘oh my gosh! I’ve heard stories about this.’ And they started chatting with each other and talking to me about these things that were in this textbook, and I had never seen that before. Whether it be a biology textbook or a physical science book, math book, anything like that,” Schallhorn said. A couple of years ago, Schallhorn started working with Andrea Pokrszywinski and other Lower Kuskokwim School District science teachers on a review of the ninth-through-twelfth grade textbooks. “We put together teams that represent the villages and grade levels, and topics and subjects such as social studies and science,” said Pokrszywinski. They decided to go with the Silicon Valley-based CK-12 Foundation. Pokrszywinski is a distance-education teacher based in Anchorage. She has used videoconferencing to teach science courses online with the Lower Kuskokwim School District for the past nine years and has used the CK-12 Foundation’s online resources previously. 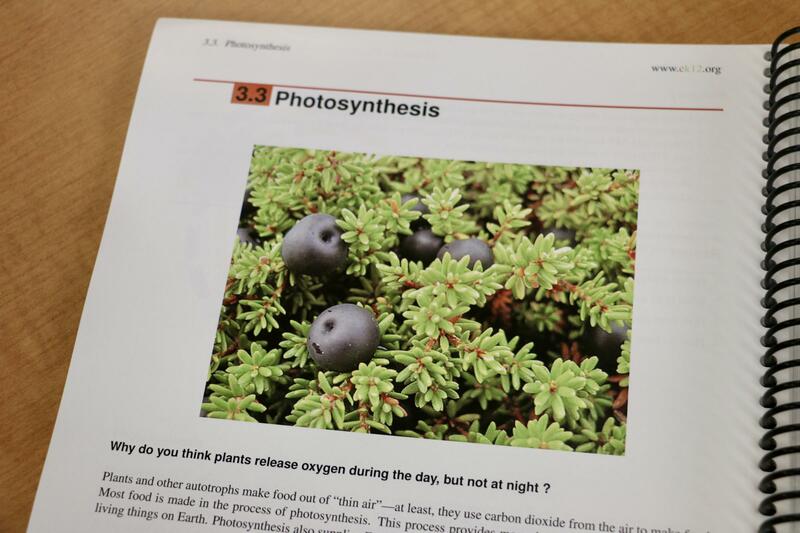 In a chapter of the CK-12 Foundation's biology textbook, an image of berries on the Yukon-Kuskokwim Tundra helps illustrate principals of photosynthesis. “What I started to notice about the book was that it explained the content very well. Being very concise and without being too wordy, and without being weighted with a lot of academic language, and using neutral, everyday experiences,” Pokrszywinski said. “To support something that we can constantly edit and re-edit and revise and make changes as necessary,” said Schallhorn. After a semester with the new, localized CK-12 textbooks, ninth graders Matthew Erik and Clayton Panruk are sold on it, as is tenth grader Dawson Erik. “Because we can connect to what it’s saying,” said Erik. The students say, along with the better sense of the Delta that the textbook gives them, they look forward to other parts of the textbook being translated since they all grew up bilingual, speaking Yugtun first. They also say that though translating may be difficult, it would still be worth it. Pokrszywinski also says that in addition to helping the district include more culturally relevant examples in their curriculum, in the long run it will help more students relate their everyday experiences to the language of science. 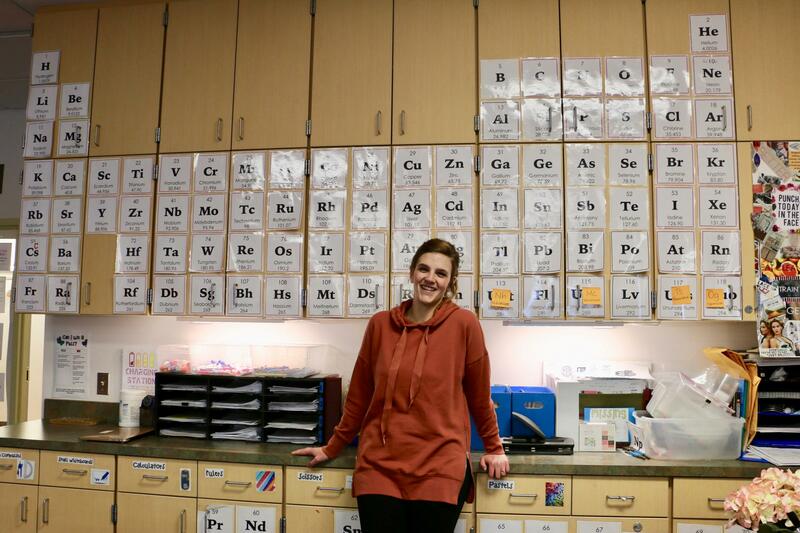 Lower Kuskokwim School District High School science teacher Theresa Schallhorn, 27, in Chefornak. Schallhorn has been teaching with the district in Chefornak for the last four years. December 16, 2017. Beginning this summer, LKSD will start the process of translating their kindergarten through sixth grade science textbooks into Yugtun. These textbooks will be used in immersion schools, and the 17 bilingual schools throughout the district.